1. Ice Cube Trays in Sets of TEN! I found these ice cube trays at the local 99 Cent Only Store. 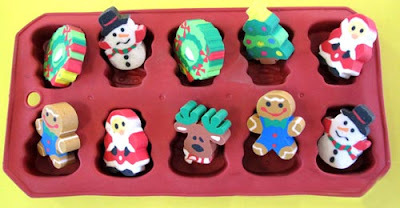 The kids love to count the holiday erasers, putting them into the slots so that they are grouped in sets of ten. We do this same activity at other times of year with other themed objects, such as spiders near Halloween, or farm animals when we study our farm unit. Generally, I use my Count-Ten trays that I got from Cuisenaire for this. But you could also just use plain old egg cartons and cut them down so that there would be only ten spaces. Differentiating instruction with these trays and the number sheets that I use seems to be a very natural and easy thing, fortunately! The children just start at the beginning with the sheet with the lowest numbers, and work their way up from there. If you staple all three sheets together, they can just go on to the next sheet when they are finished with the first one and so on. However, if they are struggling with counting out certain quantities, then I just give them that same paper back again, and they just don’t seem to mind! I just let them know that when I am really sure that they can count out those numbers correctly every time, I will let them go on to the next paper. A couple of my students are still working on counting out quantities from five to ten. Others count quantities from 11-20, and then my fastest learners usually work on quantities from 21-30. (The thing is, not every child in the “high” group is always a fast worker, so you never know!) Once a child finishes the teen numbers, they may move on to the twenties, no matter what group they are in, of course. When a child counts out a certain number, then he or she may raise their hand and ask the teacher to check it. 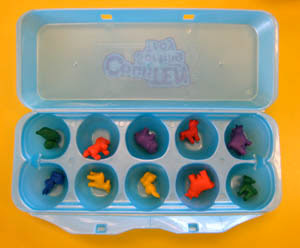 A twelve would have all of the spaces in the ice cube tray filled, plus two more. You can have the child put those extra counters on a paper plate if that helps to keep them organized. A fifteen would have all of the spaces in the ice cube tray filled, plus five more. 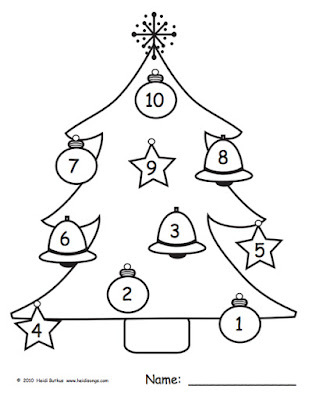 If the adult that is helping agrees that the child counted correctly, then he or she may color in that number on his or her number tree or Christmas tree. We have found that if you simply don’t give the children the crayon until they have “earned” the right to color that number (ie. counted out a quantity correctly), then you have fewer children randomly coloring in numbers that they haven’t completed yet. The number apple trees are a free download on my website, and I am including the Christmas Number tree as a free download here. I included a “Mixed Quantities” Christmas tree this time as a special challenge for those that are ready to mix up the ones, teens, and twenties. 2. 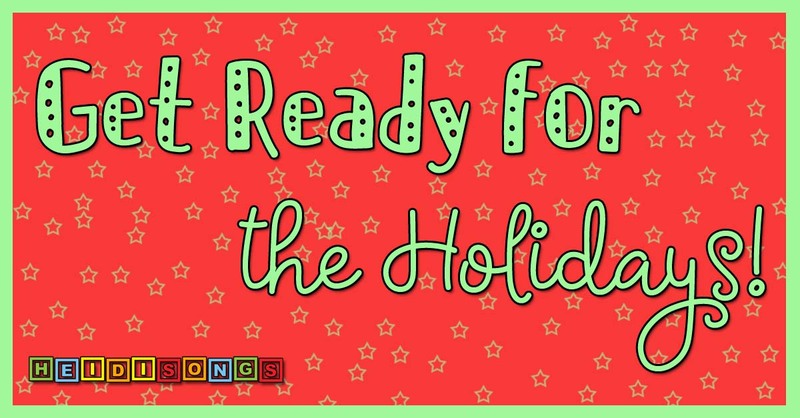 Holiday Bulletin Boards: Hooray! I posted the directions for this picture on the teachers.net Kindergarten chatboard a couple of years ago, but it makes such a pretty bulletin board and the projects are such fun that I decided to include them in my blog today as well as another free download. I have these projects set and ready to go for next week so that I can get my room all decorated nicely for the holidays before the holidays are actually OVER! Santa, too!! *Note: This year we used a paper plate for the beard/mustache and we added arms! Santa was a two day project. The reindeer does take either a couple of days or a couple of centers to finish it. 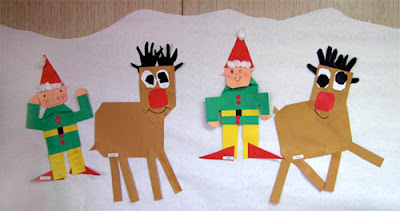 I prefer to do it all in one day; I just pick a day and declare it “Rudolph Day!” I have them complete the head at one center, the antlers at another center, and the body at the last center. 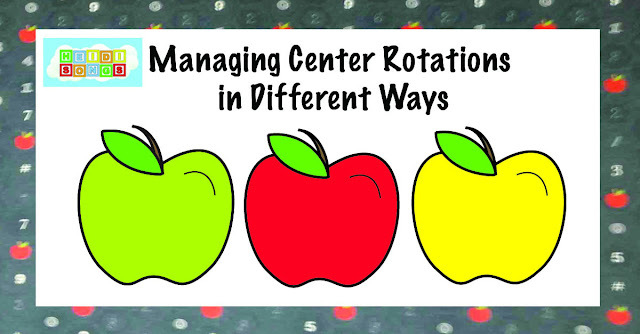 They take the completed section with them each time they move from center to center, and when they arrive at their last table they put the whole thing together. (If we need to save time, though, we can always have the children do the antlers as a pull out activity one at a time with a volunteer, since it is pretty difficult for them to trace and cut out their hand prints anyway.) This allows us to do math at the math center, and reading at the reading center, which of course is always a good idea! We will be learning about real deer for science this week as well. 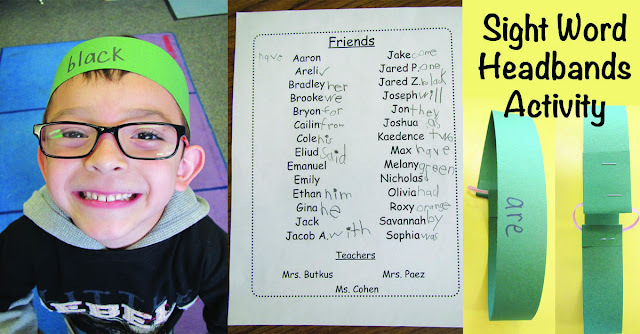 love doing this little “Singable Book” with my kids during the holiday season! It is sung to the tune of “Up on the Housetop,” and has the children counting out and drawing holiday themed objects, such as stars, ornaments, chimneys, and reindeer from 20 down to ten. 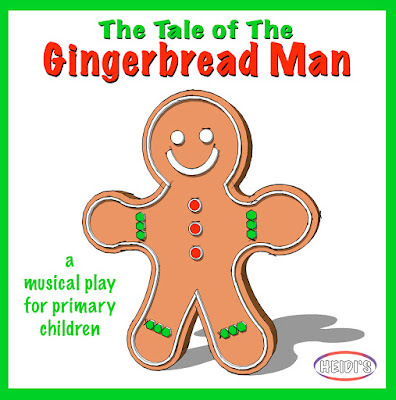 You can find it on my Little Songs for Language Arts CD and DVD, and the Printable Projects CD-Rom. (We also sell the directions as an individual download, too.) Since drawing so many pictures is really quite a chore for little kids, I drew the first ten on the page for the kids. Then, after that, the first part of the picture has been started for the children in the form of a dotted line, and the kids just have to trace the line and finish each one. This is usually “do-able” for most of my students! We usually wind up doing some of the book at the math table, and some of it after lunch as a whole group. When the children do it at the math table, I have my aide go from child to child and have them count out objects for her in the target quantity that it says on the page that they are working on. Otherwise, she would just be sitting there watching them color, which is of course not the greatest use of her time! If my students stayed longer each day, we would definitely do the whole thing in the afternoon, but our schedule at the moment does not permit it, since the children leave each day at 1:20 PM. For those of you that are curious about this graduated schedule, this is how it goes. In my district, the children attend Kindergarten from 8:15-11:35 for the first four weeks. In the afternoons during these first four weeks, we are supposed to meet with each parent and child after school for a “testing appointment.” This is a great opportunity to let parents see for themselves how their child is “really” doing in school, and then talk about it. I try to give them any needed flashcards at that time so that they can help their child learn the alphabet or letters, etc. I find this meeting time with parents extremely valuable, and it is wonderful to NOT have to try to test the children when there are a million distractions for both teacher and child in the classroom going on! After this first four weeks, we dismiss at 1:20. During this time, the teachers are required to tutor a small group of their own students three days a week from 1:20 until 2:15. This could be as few as one child or as many as you like. We are also allowed to do parent education during this time, so meeting with parents to show them how to work with their children is also permitted. Then, beginning with the third trimester, the children all begin staying until 2:15 and then the schedule stays that way until the end of the year. There is no more tutoring for Kindergartners after that point, since we consider their attention spans to really be “shot” by that point. Our district does not provide any “specials” for children younger than fourth grade, such as a computer, music, or art teacher that takes the class to give the teacher a break. So by then, our contractual hours are finished for the day anyway, though we are required to stay until our prep time is finished at 3:00. Not that anyone is finished or prepped enough to actually go HOME then anyway!!!! I’m usually there until 5:00 or later! 4. Putting On a Holiday Program? 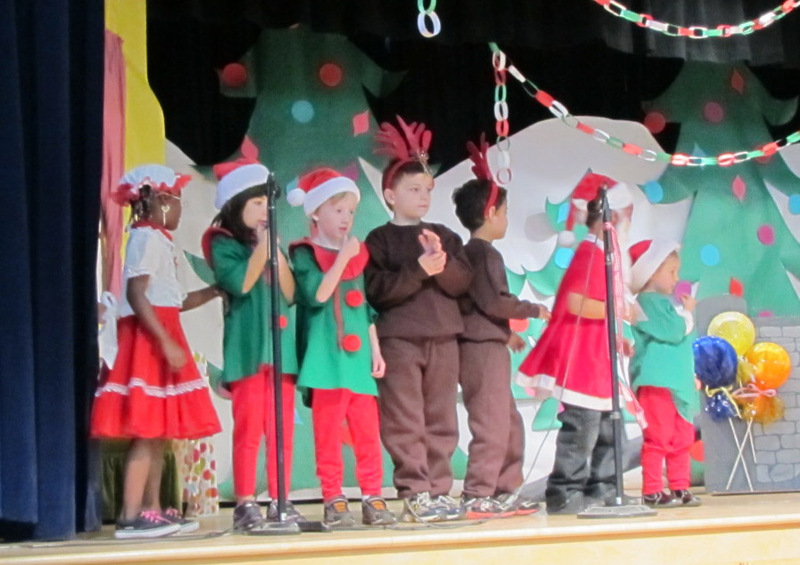 At my school, we used to be “required” to put on a holiday program sometime in December. So, I used to spend hours and hours teaching my students to sing Christmas carols, and a song for Hanukkah, and any other mult-cultural song I could come up with that would honor each of my students’ backgrounds and/or beliefs. However, there was always the problem of certain children whose religion did not permit the celebration of the holidays, etc. They used to have to just sit and color or do something else, and that always seemed insensitive and unfair to those little ones, especially if they didn’t seem to understand why they were being excluded. Check out the video clip of my kids performing this little play! It’s so much fun! And it only takes about 20 minutes from start to finish. The children do not have to speak at all; their lines are only sung. So basically, they are only acting out the story and stopping to sing some songs along the way while the teacher narrates. My other plays, “The Mitten” and “The Wide Mouthed Frog,” are structured in exactly the same way. They are all fun, short, and crowd pleasers, and well worth the time and effort to put on. I’m putting together a list of the Top 100 Classroom Blogs and I was wondering if I could ask you a few questions so I could include more information in my article. Please e-mail me at alexisbrett@gmail.com and include the title of your blog in the e-mail, thanks! I did email you back; if you don't receive my reply for some reason at heidi@heidisongs.com. Thanks, how exciting! Yes, our schedule is fantastic! I have a wonderfully supportive district! Our current administration is simply awesome! I keep waiting for someone to take that schedule away, but luckily, it doesn't happen. We do have on-site day care available for parents that can't come pick up their children. I'm sure the schedule must pose a problem for some people, but they don't mention it to the teachers anymore; it's a fact of life here! And I do work in a Title One school, so our population is solidly divided; half of the children qualify for a free lunch and half do not. So it's not like folks around here are living on easy street. My point is that the families will adjust and get used to it. Lots of moms take a late lunch and pick up on their lunch hour at 1:20. 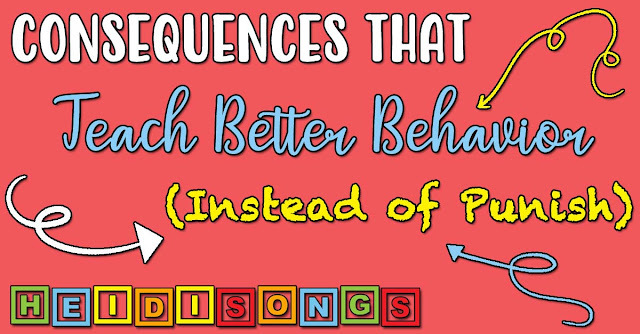 Yes, I have gobs of ideas on how to teach letter recognition! Check my blog from April 18, 2009, and also download the handout from my presentation on Singable Songs for Letters and Sounds. That one has my very best ideas for teaching the alphabet all together in one document. Thanks for this post! I had read your blog entry about the ten frames and possibly finding the ice cube trays at the dollar stores. I went today and bought 5 of them (small groups) and just got back and saw a picture of them on your blog! How exciting!! Thanks again for all your hard work! This is a random question....will you please do a post on guided drawing instructions for Christmas items. I am a HORRIBLE artist (my kids basically say...'bless your heart' lol! Thanks!! Sure, I was planning on doing an entry with some holiday guided drawing. I'm not sure which week it will be in, but hopefully soon!